Some time ago, V’s colleague invited us over. She is a north-Indian & dishes up very tasty food more to the taste we like. She also has many quick snacks & sandwich recipes up her sleeve. Everytime I’ve been to her place, she has treated us to a new snack. And V would gorge telling me with his mouth full to replicate the same snack at home. Well I obliged him this time and made Noodles Cutlet which she served us. What I liked about this snack was use of maggi to create a cutlet. I never ever thought it. 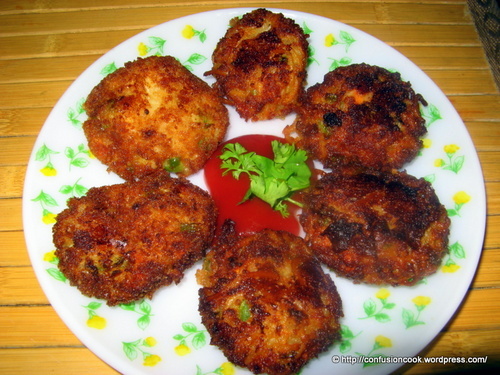 She rolls the cutlets in bread crumbs, I felt that adding them into the batter makes them more stable while frying. Boil Maggi without the tastemaker. Cook Maggi as per packet instructions. Do NOT add tastemaker. Allow them to cool. In a large bowl, mix together all ingredients – noodles, cheese, carrot, capsicum, white sauce, bread crumbs, salt & pepper. Make small round balls & flatten them into discs gently. Deep fry and serve hot with chutney or ketchup. This is a very filling snack & perfect for kids as it contains richness of veggies & cheese. You can add as many and as little veggies you want. The sauce needs to be of right consistency or the batter may become to watery.